Yesterday at Barnsley Archives I met and chatted to two people who are also very interested in recording and preserving the information on our local war memorials. One was a lady whom I've seen there many times, working hard transcribing and indexing for the Archives as a volunteer, the other a gentleman whom I've not talked to before. Jump and Hemingfield War Memorial is located on the edge of the cemetery on Cemetery Road in Jump. SP has researched nearly all of the names on the memorial and is hoping to deposit her work in the Barnsley Archives in due course. Anyone who has an ancestor on the memorial is welcome to contact SP to find out more. 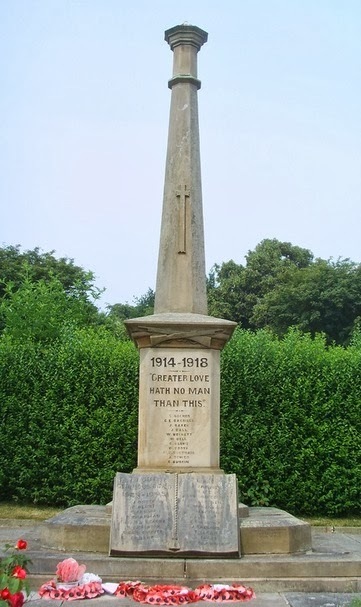 There is a page for this memorial with a list of names and her contact information on the new Barnsley War Memorials Project. The page also includes links to the memorials listings on other sites. This memorial lists 54 names from the First World War and 21 from the Second World War. Later I was handed a little booklet entitled "Barnsley and District War Memorials Calendar Book 2014". This has been produced by the Dearne Memorial Group to raise funds for the Dearne Renaissance Centre. The Dearne Memorial Group has indexed all of the cemeteries in the Barnsley area and made the records easily searchable online with results available for a very small fee. If you don't know where your ancestors were buried I would recommend a visit to this site. Remember it includes cemeteries, not churchyards, but there again most churchyards filled up pretty quickly in the 19th century so ancestors who died after about 1860 are quite likely to be on here. Bolton upon Dearne has two existing War Memorials, one in the church and one in a school playground. This second memorial was recently featured in the Barnsley Chronicle, as it is under threat because the area is to be redeveloped now the school has relocated. It lists just 45 names, men who had been pupils at the Bolton upon Dearne Board School who lost their lives in the First World War. It is a wonderfully different design, looking like an inglenook fireplace, the names of the men are listed on the beam above the opening. I will have put the pictures and links I have found for it onto a page on the Barnsley War Memorials Project - with all due thanks to the Barnsley Chronicle, the Dearne Memorial Group and the Mexborough and District Heritage Society (incidentally their site has a brilliant list and photos of all the memorials in their area). The gentleman who had brought in the booklets, PF, told me all about their most recent project - to raise funds to erect a new memorial to the fallen men and women of Bolton Upon Dearne, Goldthorpe and Highgate which will be placed in Bolton upon Dearne Cemetery. They have already collected nearly 300 names from the First, Second and Falklands wars. They do need more donations, which can be made to The Dearne Towns War Memorial Appeal - contact Peter Shields or go to the Dearne Memorials site to make a donation online. Finally, as I browsed through the little booklet (I've sent you a donation PF and PS!) I found a picture of a memorial that had not appeared on any of my lists up to now. Funnily enough the OH and I passed through Hood Green on one of our drives around Barnsley to photograph pubs and war memorials only a couple of weeks ago, but as I hadn't known about this one I have no actual photograph of my own yet. The above is from Google Streetview - but of course it's not clear enough to make out the names! As far as I can make out from the picture in the Dearne Memorials calendar there are between 15 and 20 names on this memorial - which, when you consider how small Hood Green is, is quite shocking. I look forward to the next time the OH and I are out and about - I know where we are going! Yesterday was a very interesting day and it was lovely to meet other people who are as keen as myself, JA and GB to preserve and record these memorials.